Masters Tournament and Major Championship Highlight DVD's and Books. Free Shipping - United States captain Paul Azinger looked to end the American drought at the Ryder Cup, where the U.S. had not won since 1999. He led his group of veteran players to a historic victory, players included Phil Mickelson, Jim Furyk and Stewart Cink, along with a group of rookies, against captain Nick Faldo�s European team, including Sergio Garcia and British Open champion Padraig Harrington at the 37th Ryder Cup, played at the Valhalla Golf Club in Louisville, Kentucky. $33.99 Click Here to purchase - Includes Free Shipping Continental U.S.A.! - Now in Stock! Free Shipping - World number one Tiger Woods took the lead in the second day. Before it was over, golfers Woody Austin and Ernie Els came close to making it a duel in the scorching sun at Southern Hills, Oklahoma. The confrontation never materialized as Tiger kept them at bay to win his 13th career major. Relive all the best moments! 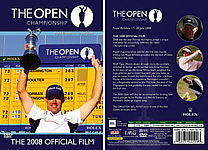 (Pre-order your copies of the 2007 PGA Championship DVD). Free Shipping - It's always a special occasion when The Open arrives at St. Andrews. Throughout the Championship's long history, the game's greatest players have battled for success over the Old Course. And in 2005 Tiger Woods returned to dominating form, pulling away from a top-class field to repeat his victory in the Millennium Open and take his haul of Majors victories into double figures. The 134th Open at the home of golf was also where Jack Nicklaus chose to end his phenomenal career. His 18 Majors titles included three victories in The Open, two of then at St Andrews, and 50,000 spectators crowded the Old Course in an emotional farewell. The official film of The 134th Open tells in full the story of the world's oldest and greatest golf Championship. It includes not only Tiger's victory and Jack's farewell, but all the moments of drama and outstanding play that made it so memorable. Free Shipping - The Royal and Ancient Golf Club had little hesitation in bringing the Millennium Open Championship back to St Andrews - it is after all the home of golf. Suitably, all the surviving winners of the Claret Jug were invited to play in a special event to commemorate this unique Championship. This film looks back on all the drama of the greatest Championship in golf, played on the game's most famous course and dominated by Tiger Woods, the most prominent player since Jack himself. The Open Championship saw it's highest ever attendance figures, and in perfect weather for all four days, Tiger held back the charge of contenders Ernie Els, David Duval, Thomas Bj�rn, and David Toms with four bunker-free rounds in the 60's (only the third Open winner to do so) and a final score of 269, eight strokes ahead of Bj�rn and Els. This would give Tiger Woods his first Open victory at St. Andrews, and make him the youngest player to complete the career Grand Slam of professional major golf championships. 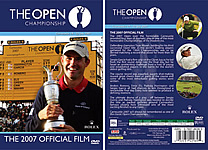 2008 British Open Championship DVD: Harrington wins second consecutive Open: As 53 year old Greg Norman fades on Sunday ..
Free Shipping - The 137th Open, at Royal Birkdale, will be remembered for its wild weather, its pure drama - and for a champion who almost didn't play in the tournament. Padraig Harrington, defending the trophy, admitted on the eve of the first round that had it not been The Open, he would not have played. When he pulled out of practice to have intensive treatment to his right wrist the odds on Harrington retaining the crown went rocketing upwards. Now the trophy is heading back to Ireland and at the end of this tournament Harrington was the runaway champion by four strokes..
Free Shipping - The 2007 Open over the formidable links of Carnoustie provided four days of dramatic play in one of the most memorable Championships of the modern era. Andres Romero, Ernie Els, Padraig Harrington and Sergio Garcia all had chances to win throughout a remarkable final day. The ultimate drama of a play-off between Garcia and Harrington was needed to decide the title as packed galleries around Carnoustie's famous closing hole witnessed one of the most exciting finishes to any Open. Free Shipping - Tiger Woods' triumph in the 1997 Masters earned a place in history. Playing in only his third Masters, he became the Tournament's youngest champion at the age of 21. From Gene Sarazen to Byron Nelson; from Sam Snead's opening tee shot Thursday to Tiger's final record-setting putt Sunday, this official video produced by Augusta National, Inc. contains all the excitement and pictures not seen on television. $29.99 Includes Free Shipping Continental U.S.A.! Free Shipping - The multi-million dollar renovated PLAYERS Stadium Course and new clubhouse at TPC Sawgrass was the backdrop for Phil Mickelson's 31st PGA TOUR victory in the 2007 PLAYERS Championship. This renowned PGA TOUR event showcases competition at the highest level to produce champions, and provides fans with some of the greatest moments in golf. Relive the intensity, passion and excitement in this official program featuring exclusive footage and interviews in high definition technology. Free Shipping - Zach Johnson held off a contingent of golfers including four-time Masters winner Tiger Woods and two-time U.S. Open champ Retief Goosen for a two-shot victory in the final day to become the first golfer to win outside the final pairing since 1990. All the excitement of the 2007 Masters is featured in this official production of Augusta National, Inc. including many pictures not seen on television, replays of the great shots, summaries, commentary from the players, the poignant green jacket ceremony, and much more! $29.99 Includes Free Shipping Continental U.S.A.!29.99 Includes Free Shipping Continental U.S.A.! Free Shipping - Knowing that the top five players in the world were on Sunday's leader board, the final result of the 70th Masters was not a surprise, yet the Tournament was loaded with surprises. Phil Mickelson, the 2004 champion, won his second title and recorded his eighth straight top 10 finish in Augusta. The official video of the 2006 Masters contains pictures not seen on television. Be part of the tradition and relive the Highlights of the 2006 Masters Tournament. Free Shipping now available on DVD - Share the elation as Jack Nicklaus, winless at Augusta for 11 years and 3 shots back after 9 holes on the final day, charges from behind to win. See Tom Kite drop to his knees on the 18th green, as his putt for a tie dies inches from the cup. You'll find the 1986 Masters to be even more thrilling the second time around. It's a DVD you'll treasure for a lifetime. $29.99 - Includes Free Shipping Continental U.S.A.! Free Shipping Available on DVD are the official highlights of the historical 2005 Masters. Every year, the anticipation for this historical event mounts and all eyes focus on Augusta , Georgia as the top pros battle it out. This year quickly became match play between the leaders, Tiger Woods and Chris DiMarco, as they distanced themselves from the field after two holes. In the remarkable stretch duel, Woods made a 15-foot birdie putt, down the slope, on the first extra hole Sunday to defeat DiMarco in a tense playoff where either could have claimed the green jacket. Having now won nine major championships, Tiger Woods dedicated his fourth Masters Tournament title to his father, Earl, who was ailing and unable to attend. Relive that excitement over and over again by ordering your DVD today... Additional �Special Features� are included only in the DVD version! 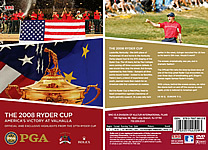 Free Shipping; Relive the excitement of the 87th PGA Championship. Phil Mickelson has done it again, claiming a major championship with more final-hole dramatics. Completing his weather-suspended final round in exciting fashion, Mickelson birdied the par-5 18th at Baltusrol with a brilliant up-and-down from the heavy greenside rough to win the 87th PGA Championship for his second career major title. $35.99 - Includes Free Shipping Continental U.S.A.! Free Shipping; Available on DVD are the official highlights of the historical 2004 Masters. Every year, the anticipation for this historical event mounts and all eyes focus on Augusta , Georgia as the top pros battle it out. At the 2004 Masters, Phil Mickelson finally breaks through to claim his first major title! Relive that excitement over and over again by ordering your DVD today... Additional �Special Features� are included only in the DVD version! Free Shipping - the 2001 Masters was one of the most anticipated events in sports history. Tiger Woods arrived at the 2001 Masters Tournament with one mission in mind: become the first golfer ever to win four consecutive professional majors. The official video of the 2001 Masters includes highlights of this historic April week in Augusta beginning with Wednesday�s Par 3 contest, continuing with all the excitement throughout the week and climaxing with Sunday�s fireworks. Includes footage not seen on television. Special features include complete post tournament interview with Tiger, and highlights of opening and closing ceremonies.